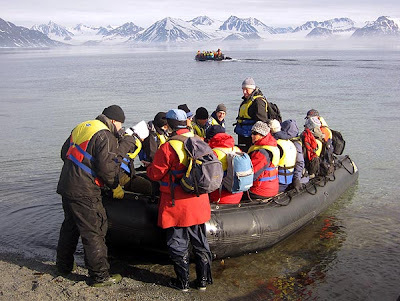 The Association for Arctic Expedition Cruise Operators (AECO) has presented guidelines for landings on Spitzbergen – known as the “Svalbard Site Guidelines.” Nine site-specific guidelines for locations along the west coast of Spitsbergen are available. They can be found at www.aeco.no/guidelines. “The guidelines give information about specific sites and advice on how to behave on these sites in order to avoid any unwanted influence when visiting,” according to AECO. Members of AECO and their guests are obliged to follow these guidelines, but AECO would like to invite and encourage all other visitors to do the same, the organization said in a prepared statement. Its members have since many years operated in accordance with the guidelines and also ask guests to follow a set of general “guidelines for visitors to the Arctic.” These are also available on the same website. The Svalbard guidelines have been developed through a project financed by the Svalbard Environmental Protection Fund. The project group has had the following participants: Archeologist Per Kyrre Reymert, archeologist Kristin Prestvold, biologist Georg Bangjord, botanist Dagmar Hagen, field-ornithologist/photographer/artist Trond Haugskott, biologist and expedition leader Ko de Korte, expedition leader/assistant project manager Joern Henriksen and project manager Frigg Joergensen. The Governor of Svalbard represented by tourism adviser Stein Tore Pedersen has acted as adviser. The project has based the site assessment on a methodology developed by NINA (The Norwegian Institute for Nature Research) and NIKU (The Norwegian Institute for Cultural Heritage Research). Dagmar Hagen from NINA has been in charge of the assessments. “Svalbard Site Guideline’s” design and web-site has been developed by TANK – Tromso. AECO includes 16 members operating altogether 22 cruise-vessels in Arctic waters, ranging from 10 to approximately 300 passengers. In 2011 AECO-vessels carried some 13,000 passengers to the Arctic and among these, 10,00 visited Svalbard. AECO’s main objective is to ensure respectable, environmentally-friendly and safe expedition cruise activities in the Arctic.